The baseball team does not have a break all day. As part of a revamped offseason conditioning program, head coach Gregg Ritchie’s team gets up at 5 a.m., three days a week, to travel to the Vern for a lift workout and healthy breakfast until 8:30 a.m., before heading back to Foggy Bottom for class from 9 to 2 p.m. Then practice goes until 6 p.m.
Chris Hays, the mastermind behind baseball’s new conditioning program, hopes that the strength the team has built throughout the off-season will serve as the foundation for what seems to be a promising year for the Colonials. Hays mentored under the Pittsburgh Pirates’ conditioning team before getting the call from Ritchie to join the Colonials’ staff. Players and coaches like the individuality of Hays’ program, which is more baseball-specific than in years past. Though some upperclassmen pitchers were initially hesitant about the new workout regimen because they were used to their own routine, the entire team is now on-board after the players agree that they are already in game-shape in early February. Pitching coach Brendan Monaghan, who joined the GW coaching staff in December, is impressed with the strength of his pitching staff. Hays has also tailored his offseason program to reflect the aggressiveness of a Gregg Ritchie ball club. 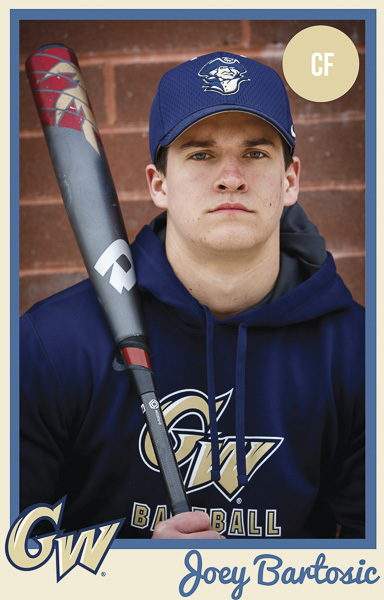 GW loves to run and steal bases – the team finished third in the A-10 in total stolen bases last year – so Hays’ primary focus in the fall was on technique and form. Players like Robbie Metz and Joey Bartosic, especially, could benefit from the training as they love to be aggressive on the base paths. Bartosic, who has 41 career steals, joked after a practice that he looks forward to eclipsing 50 steals for his career to pass Ritchie on the all-time list. On Feb. 6, Ritchie put his guys through a Marine workout of conditioning and team-building exercises at the Quantico base. They started off with a four-mile run, which was was broken up into hill sprints, body weight squats and motivational speeches. The trail emptied out into the base’s football field, where the boys did bleacher stair runs and 25-yard sprints to the point of exhaustion. The baseball team feels like it has won the off-season. It’s almost time to see what it can do this spring.